9413 Inverted in Duke of York River, Southampton Island, NT. Photo: Pat Armstrong © 17 July 1975 - via Chris Shelley. • 9413 Royal Canadian Air Force. Delivered 06-Sep-1960. Designated as CSR-123. Initially assigned to 438 Squadron, St. Hubert, QC. Nov-1960. Transferred to 401 Squadron, also at St. Hubert, QC. Accident: St. Hubert, near Montréal. 09-Sep-1962. Damaged in a training detail. See further info. below. 08-Mar-1963. Into storage at Dunnville, ON. 18-Sep-1963. Allocated to 411 Squadron, CFB Downsview, ON. Accident. at Duke of York River, Southampton Island, NT. 17th July 1975. During take-off from a gravel bar along the edge of the River, the aircraft became airborne but did not gain altitude. Shortly thereafter, it contacted a steep gravel river bank, made a shallow turn to the right, settled into the river and slowly nosed over, coming to rest inverted in three or four feet of water. A salvage team, which included 411 technicians, was dispatched. The engine was saved, but the rest of the aircraft was abandoned, because corrosion had already set in, accelerated by the high salt water content of the water. Otter 389 was delivered to the RCAF on 6th September 1960 with serial 9413. It was assigned to 438 Squadron at St. Hubert, near Montréal, transferring to 401 Squadron, also at St. Hubert, in November 1960. It suffered a 'B' category crash on 9th September 1962 on a training detail out of St. Hubert. After take-off, at about 100 feet, after the student had been instructed to raise the flaps to the climb position and at an airspeed of 70 knots, the throttle was retarded to simulate engine failure. The Tower had been advised of their intention to do a practice forced landing on the remaining runway. The student had just lowered the nose for the glide when the Tower requested they land past an intersection, as another aircraft was landing on one of the intersecting runways. The instructor acknowledged the transmission, not realizing that the student had raised the flaps to the cruise position. The Otter began sinking rapidly. The instructor took over control at once and applied full power but the aircraft landed heavily on the port wheel, bounced but remained airborne. An in-flight inspection showed that the port strut was pushed up into the fuselage. A safe landing was however made. On 14th September 1962 the Otter arrived at DHC's Downsview facility for repair. When repairs had been completed, 9413 was put into storage on 8th March 1963 at Dunville, as a reserve aircraft. Its period of storage was relatively brief. On 6th September 1963 Otter 9425 (408) of 411 Squadron, Downsview was damaged in an accident, and on 18th September 1963 9413 was allocated to 411 Squadron as a replacement, where it was to serve for many years. It made occasional trips to the United States, an example being a deployment to Fort Drum - Wheeler-Sack AAF., New York in September 1974 together with several more of the Downsview-based Otters, transporting troops of the Queen's Own Rifles regiment. 9413 continued to fly for 411 Squadron until it was written off in an accident on 17th July 1975 at Duke of York Bay on Southampton Island in the Northwest Territories. During take-off from a gravel bar along the edge of the Duke of York River, the Otter became airborne but did not gain altitude. Shortly thereafter, it contacted a steep gravel river bank, made a shallow turn to the right, settled into the river and slowly nosed over, coming to rest inverted in three or four feet of water. Water began to pour in on the two crew and five passengers, who were hanging upside down still strapped into their seats. They managed to free themselves and wade ashore. The accident report found that the pilot elected to take off from an “uncleared, austere airstrip” of unknown exact useable length, in unfavourable wind conditions, at or near maximum allowable gross weight. The aircraft captain had failed to brief his co-pilot and assign him the task of monitoring the cockpit instruments during the critical phase of the take-off. The air detachment commander was required to fly as a line pilot on a regular basis. This, together with being subordinate in rank to the Otter detachment commander, made effective control of flying operations virtually impossible. The 411 Squadron history provides some further details, and gives the background to the squadron's operations at this time: “During July 1975, 411 again returned to the Arctic in strength. Summer Camp was based in Churchill, Manitoba with most of the flying proceeding north. A survival camp, through which squadron members rotated, was set up at South Knife Lake. With the lure of rumoured good fishing, personnel were enticed to spend overnight on the summer tundra where, it seemed, the world's biggest mosquito colonies flourished. Another challenge was a trip to Eppler Lake, where a dirt track served as an airstrip. The take-offs at the short Eppler strip tested the nerves of passengers as well as pilots, with the Otter rarely clearing the surrounding terrain by more than a few inches”. “Further north, 411 pilots supported a federal government project to accurately map Southampton Island. Two Otters with oversize 'buffalo' tires operated out of Coral Harbour. These aircraft transported surveyors around the island, landing on flat pieces of unprepared ground (such as eskers) and photographed the survey control points, which were white crosses laid out on the ground by Army survey crews. The aerial photography was accomplished using a three inch Vinton camera mounted in the aft fuselage of the Otter. This required a level attitude, a constant altitude and accurate tracking. The job was made more difficult by the fact that the target disappeared under the nose several seconds before passing beneath the camera. The extremes in temperature and the presence of sand occasionally caused the cameras to malfunction, necessitating re-takes of several photo targets”. “Using unprepared gravel airstrips was also difficult. 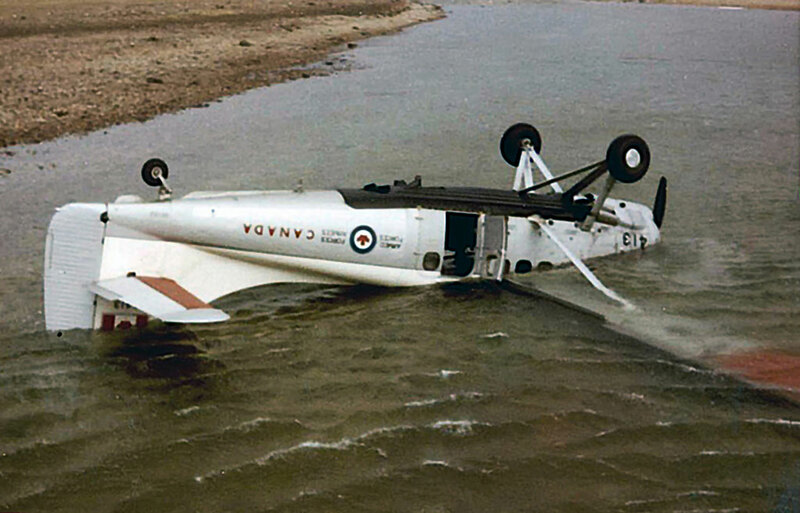 During this tasking, while attempting a take- off, Otter 9413 rolled off the end of an esker and continued into the Duke of York River. It over-turned and water began to pour in on the crew and passengers, who were hanging upside down still strapped into their seats. No-one was hurt. An unknown quantity of freshly caught Arctic Char escaped from the aircraft, complicating the investigating team's task of estimating the take-off weight. A salvage team, which included 411 technicians, was dispatched. The engine was saved, but the rest of the aircraft was left, because corrosion had already set in, accelerated by the high salt water content of the water. 9413 was abandoned in its cold, wet, final resting place and the mapping continued when another Otter was sent north”.